A very good read, with some interesting ideas and info that never made it into the series itself. I particularly found the constant "This isn't Star Trek" feel amusing, what with the "The Cylons are not the Borg" and Moore banning any "Galactica encounters a space anomaly" plots. I think it's a pity that the show never really went with the idea presented in the Bible of going to the Cylon homeworld and going into detail on their culture and society. Though they did sort of do that with the bits where Baltar was on the Basestar, and what we saw of Caprica 6 on Caprica. One thing I was always curious about. In oBSG there were other, independant alien races around. In nBSG, there weren't.....at least that we ever saw. I kind of feel cheated there, to be honest. Mark wrote: In nBSG, there weren't.....at least that we ever saw. I kind of feel cheated there, to be honest. I think that was another concious decision - no bumpy-forehead aliens. That was a pretty interesting read. I have allways liked the juxtaposition of such hyper advanced things as space folding tech with relatively primitive weaponry and support technologies. 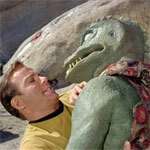 Also the focusing on character driven stories, kind of like TOS Star Trek. Love the character description for Number 6. Everyone else gets pages and pages. She gets "Number Six : The Woman as Machine."